This is one of the harder bosses to encounter. Why you ask? - He is not alone... o.o!! Basically like all Marid mobs, Hildesvini have a chance of spawning additional Chigoes. In Einherjar their name is Djiggas. Theese little buggars are what makes this boss so hard. There are reports of the boss poping up to 6 Djiggas during the fight. But there are also reports stating he poped no Djiggas at all. Non the less - Assume the worst. Our plan to tackle this is simple. Instead of the normal single target spells, BLM's will primarily use -ga spells. 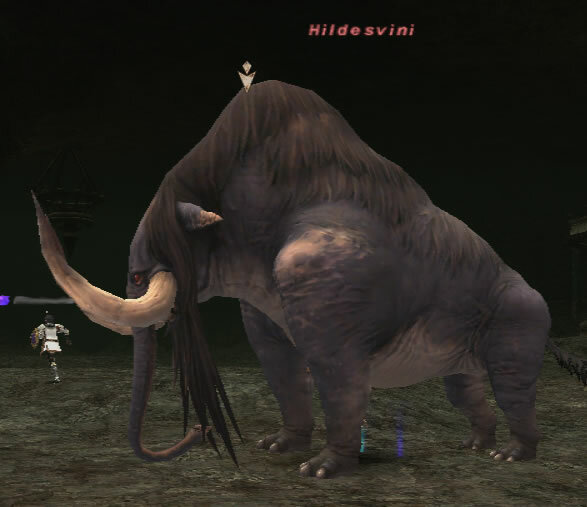 Seeing as the Djiggas spawn in the close vecinity of Hildesvini, most of them should go down fast from theese spells. Warrior's will provoke any Djigga they see, for 2 reasons - Stop them from runing around, and to keep them in the close vecinity of Hildesvini so they don't end up outside the AoE range of the -ga spells. Hildesvini's standard move is called Proboscis Shower. What it do is it heals Hildesvini for somewhere between 1-10 000 hp. This move is something we really need to avoid as far as possible. It 'is' stunable, however the stun window is quite short and he builds complete resistance to Stun after about 5-10 minutes of steady stunning. Basically what we want to do is kill him under the influence of CS Stuning. This gives us a rather long window to do it - 2 minutes. The biggest issue with this boss is he can take a long time to kill cause of the TP self cure move. The Djiggas will add upp to the trouble but should be a lesser concern if the -ga spells do their damage.